“It all happened so suddenly, I was just back from work and my wife told me that he has been coughing all day. Suddenly I saw him struggling and gasping for breath and I knew that something was wrong,” says a distraught Ashok, Rithwik’s father. Almost 5, Rithwik never had any health complaints. 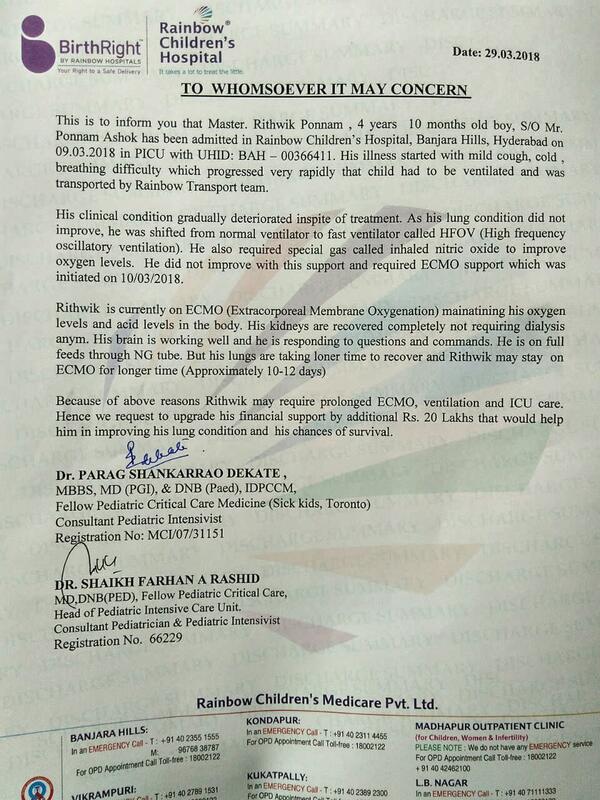 Apart from an occasional fever, he was a healthy child. But last week, all that changed and he is now in the ICU on a high-end ventilator, struggling to stay alive. The fear-stricken parents don’t even know what is plaguing their little boy. Life changed for the worse overnight, for Rithwik and his family. He had started school just four months ago, and loved going there. A little kid who lived his life, full of giggles and carefree ease can’t even look at his parents and smile now, owing to his deteriorating condition. All his parents want, is for this nightmare to pass and Rithwik to come back to their arms, laughing like before. Since a day before, Rithwik had a slight cold and cough. Ashok took him to a doctor who prescribed him some medicines. But things didn’t get under control. Next evening, Rithwik’s cough had gotten very bad and he could not breathe any more. Ashok rushed his son to the hospital. 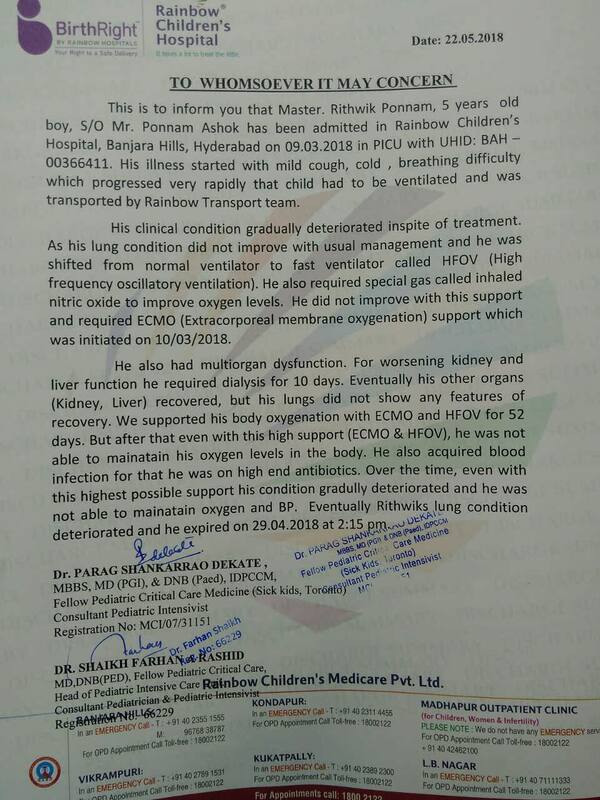 But the hospital was small and lacked the equipment necessary to evaluate Rithwik’s condition, so they were immediately taken in an ambulance to a bigger hospital in Warangal. 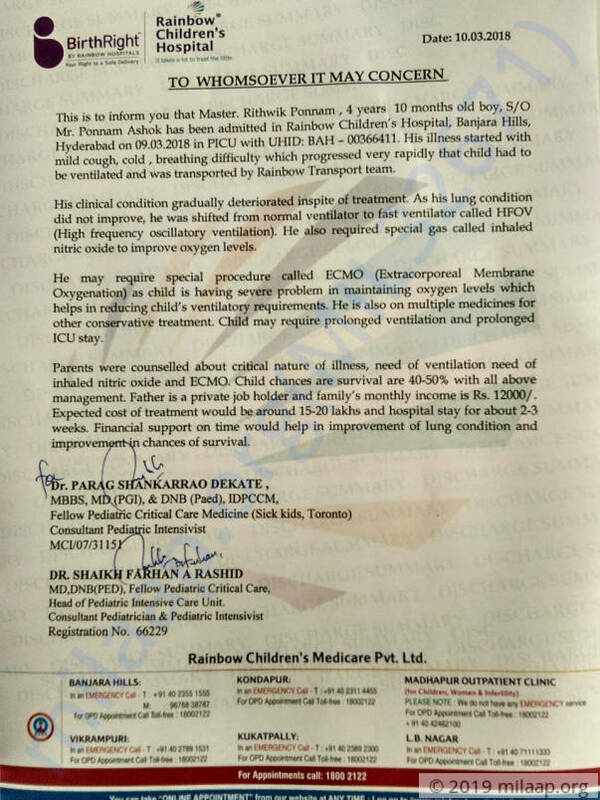 Even at the second hospital, the doctors said they didn’t have the necessary equipment and Rithwik’s best chance would be to immediately go to Hyderabad for treatment. 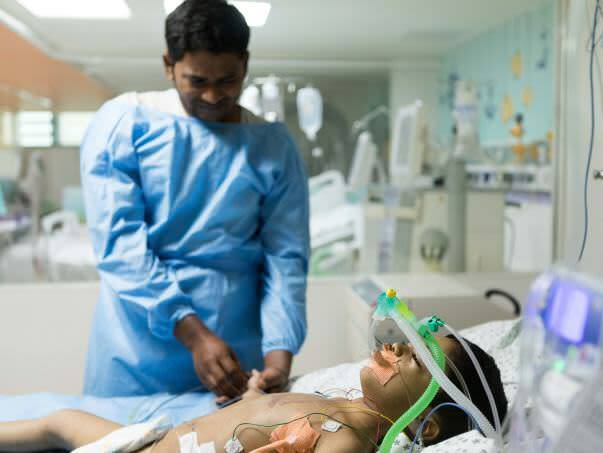 Running around from hospital to hospital in despair, Ashok didn’t waste any time and brought his ailing son to Hyderabad. 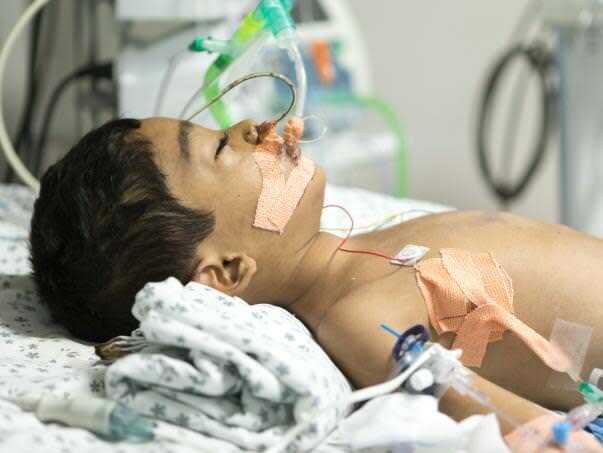 Here at the Rainbow hospital, he was immediately taken to the ICU and put on a ventilator, so that he could breathe. But even the ventilator didn’t help and Rithwik still struggled to breathe in gasps. 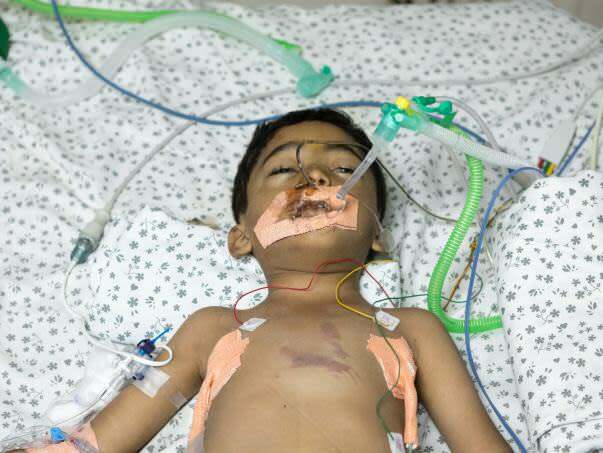 Realising how grave the situation was, he was put on a high-end ventilator that facilitates breathing, while the doctors got busy with tests to determine what was wrong with this child. His lungs are infected, causing him extreme difficulty in breathing. Throughout the episode which seemed straight out of a nightmare, Ashok kept breaking down in sobs. He had no idea how his perfectly healthy child was suddenly fighting death. Back home, near Warangal, Rithwik’s mother, Rachita, constantly calls to check on what is happening at the hospital. 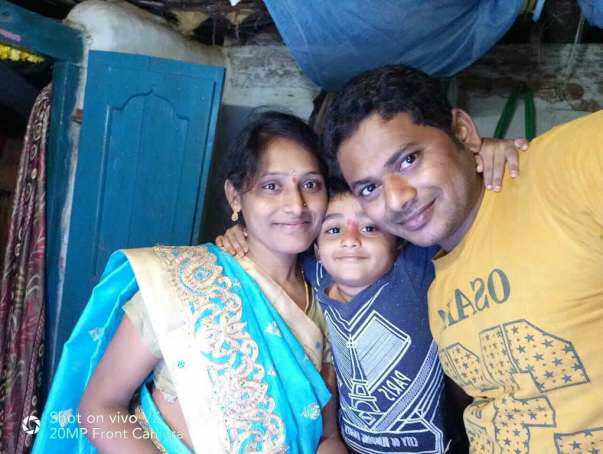 Their younger son is just 6 months old, and Rachita had to stay back to take care of him. But her heart is with Rithwik at the hospital. After all, imagine the pain a mother must go through when her child is fighting for his life and she is unable to be by his side. 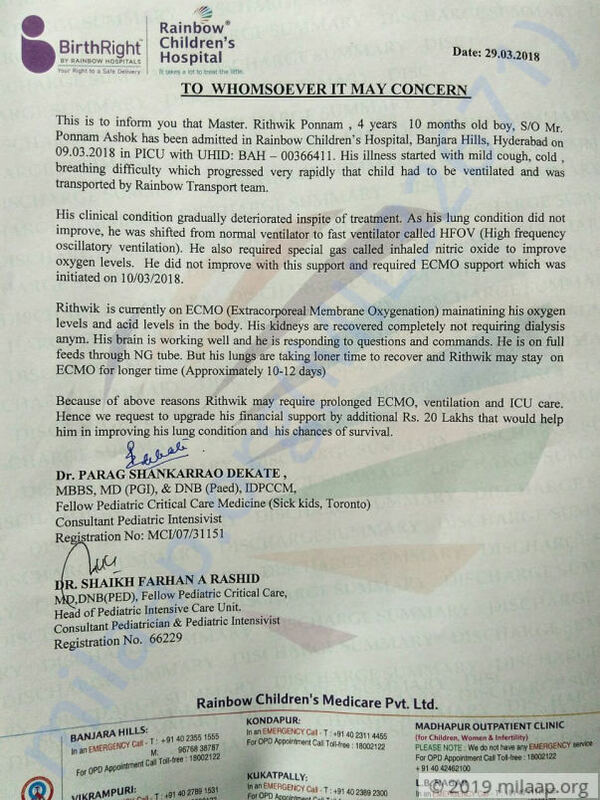 Although the ventilator is keeping him alive for now, the doctors have told him that Rithwik would need ECMO treatment in order to survive and recover. It is an expensive procedure which aids a person is respiration. For little Rithwik to survive, undergoing treatment is inevitable. Ashok holds a low-paying job in a private company, and can barely keep his household afloat with his meagre income. His financial state does not let him afford this treatment, but saying no means losing his child. Ashok spent all his savings and money borrowed from his employers towards Rithwik’s treatment. Since Thursday, he has already spent nearly Rs 5.5 lakhs towards the medical bills and now has no means to pay for the treatment anymore. 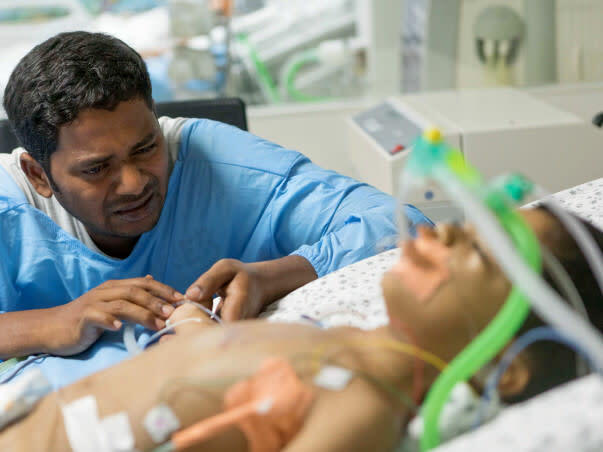 To save his son, he desperately needs your help. Your contribution can make a difference by giving a second chance at life, to this innocent little child.